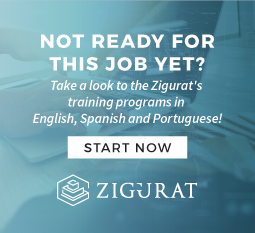 We are looking for an enthusiastic architect or engineer to join the School of BIM and Smart Cities of Zigurat Global Institute of Technology as salesperson in Barcelona. Introducing our online programs via multiple channels, including outbound calls, emails and the most innovative and new sales solutions in the market. A highly motivated person keen to learn and looking to expand into new markets. We want to work with an architect or engineer capable to understand our client's needs and show them how can be covered by our programmes, since learning new methodologies, software and tools are necessary to grow as a person and as a professional in a sector in continuing development. Civil Engineering and Architecture Degree or any other technic profile related or specialized in Construction sector. Proficient level at Microsoft Suite. Strong attention to detail, and extremely organized. Must be able to adapt to evolving role, and take on new challenges as they become delegated to your position. Ideally some demonstrable sales experience, preferably in education, but not essential. Ability to work independently with a strong drive for results. Fluent level of English, other languages will be valuable. Drive sales volume via outbound and inbound, lead generation and closing sales. Consulting with prospective clients by addressing their questions and needs to identify an appropriate program. Establish business relationships with prospective customers to generate new business. Develop clear and effective written proposals/quotations for prospective clients upon request and with manager approval. Identify advantages and key differentiators as compared to competitors within our industry. Plan and organize personal sales strategy. Keeps abreast of all programs updates, including competitor´s activities. Training will be provided, so do not hesitate to apply if you don’t know much about BIM or Smart Cities. Having been in a sales position it is not mandatory neither, actually, the best sellers are the one who listens well to their clients and has the innate capability of empathizing! The candidate will be able to enroll in one of our Global Programs for BIM Management or BIM applied to infrastructure projects.